Pen expands its digital presence, Launches New Channel ‘WOW’ in Delhi! 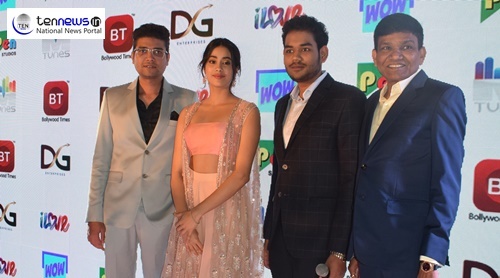 New Delhi: Jayantilal Gada’s film production and distribution company Pen India launched a new TV channel ‘WOW’ in National Capital today. After making a mark in the Indian entertainment space for over three decades, Jayantilal Gada, owner of Pen Studios, will now offer a new property to TV aficionados. His new channel, WOW, was unveiled at a star-studded event in Delhi today. The Program was graced by the father and daughter Boney Kapoor and Jahnvi Kapoor. WOW will be offering best of cinema and music on the small screen. The channel will be helmed by his younger son, Akshay gada. Celebrated producer Boney Kapoor and his daughter, Jhanvi, who has just ventured into Bollywood with her first film, Dhadak. Jhanvi Kapoor, who is set to foray into films gave her best wishes and introduced Akshay on stage. Anita Barar’s Documentary ‘Crossing the Border’ Screened at BIMTECH, Greater Noida!